The latest study published in the New England Journal of Medicine, confirms that resistance to the current frontline antimalarial, artemisinin, is now present in Eastern Myanmar, Thailand and Southern Vietnam, as well as Western Cambodia. The latest study published in the New England Journal of Medicine, confirms that resistance to the current frontline antimalarial, artemisinin, is now present in Eastern Myanmar, Thailand and Southern Vietnam, as well as Western Cambodia. The paper also provides worrying indications of emerging resistance in Central Myanmar, Southern Laos and North-eastern Cambodia. Reassuringly the study results do not identify the spread or emergence of drug resistance in the three African study sites in Democratic Republic of the Congo, Nigeria and Kenya. In response to the need to stop the thread, the TRAC team confirmed a short-term solution to prolong the therapeutic life of artemisinin combination therapies, or ACTs, in areas where resistance is now established. By increasing treatment from three days to six days, patients in Western Cambodia were cured at a rate of 97.7% after an assessment at 42 days. The study also found that patients with slow parasite clearance had a higher prevalence of malaria gametocytes - the only stage of the malaria parasite’s complicated lifecycle that can be spread from the human host back to the mosquito - measured in their blood pre and post-treatment, which suggests more potential for transmission thereafter. “Should drug resistance continue to spread or emerge in Africa, thousands if not millions more lives will be at risk, years of effort and investment could be lost. It may still be possible to prevent the spread of artemisinin resistant malaria parasites by eliminating them, but that window of opportunity is closing fast,” said Prof Nicholas White, senior author of the study and Chairman of the Bangkok-based Mahidol Oxford Tropical Medicine Research Unit (MORU), Professor of Tropical Medicine at the University of Oxford, and Chair of WWARN. The Tracking Resistance to Artemisinin Collaboration (TRAC) was a three-year programme established to identify the extent of spread and emergence of artemisinin resistance. Supported by multiple institutes, including WWARN researchers based in Thailand, the teams mapped the extent of artemisinin resistance across 15 research sites in 10 countries in Asia and Africa. To identify sites where resistant parasites occur, the study teams measured two parameters. The first, using WWARN’s Parasite Clearance Estimator, determined the rate at which the malaria parasite is cleared from each patient’s blood. A key indication of antimalarial drug resistance is a reduced rate at which the parasite is cleared from the patient’s system after treatment. The second approach tested and validated a recently discovered genetic marker of resistance (kelch 13) in the DNA of the malaria parasites obtained from patient blood samples. 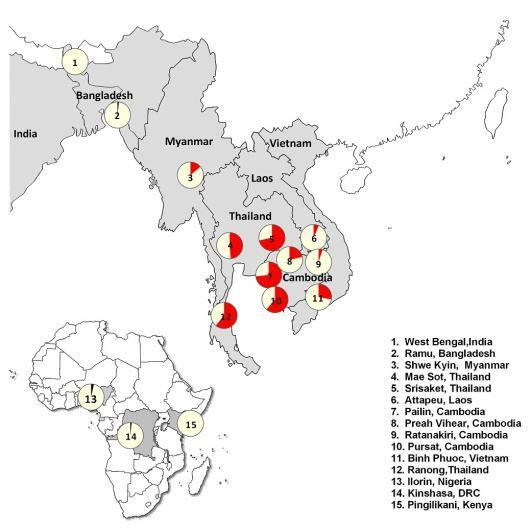 The results confirm that P. falciparum artemisinin- resistant parasites are now prevalent across the Greater Mekong Region of Southeast Asia. The researchers from the 15 study sites treated 1241 patients - each site supported by WWARN’s quality assurance experts who were responsible for specimen collection from patients, processing and tracking, and microscopy, as well as contributing to the overall operational and scientific coordination. The quality assurance systems and regional training ensured that high quality data could be collated to define the resistance profile of the parasites in all 15 study sites. Additionally, WWARN researchers developed standardised procedures and travelled to field sites to train local teams on how to collect and process blood samples for genomic, transcriptomic and in vitro phenotyping studies. This is just one example in which WWARN is providing researchers with technical support. The Quality Assurance and Quality Control team members are also working with 48 research groups in Asia and other regions to improve the analysis of antimalarial drug regimens during clinical trials, and in turn, enhance the quality of the research data captured. The TRAC collaboration combined the efforts of researchers and clinicians across disciplines, areas of expertise and research institutes to provide important evidence of the spread and emergence of antimalarial resistance, and a clear signal that we need to step-up our response to stop any further spread, and identify any new foci of artemisinin resistant parasites. Success of these efforts is crucial to the global campaign to eventually eradicate malaria. “Antimalarial resistance must become a global public health priority, without delay, to avoid dramatic reverses in the gains we’ve made against this deadly disease over the past decade.” concludes Prof White. Elizabeth A Ashley et al. Spread of Artemisinin Resistance in Plasmodium falciparum Malaria. Advanced online publication in New England Journal of Medicine. July 31 2014; 371:411-23. DOI: 10.1056/NEJMoa1314981. The TRAC project was funded by the UK Department for International Development (DFID). Additional support was given by the Worldwide Antimalarial Resistance Network (WWARN), the Intramural Research Program of the National Institute of Allergy and Infectious Diseases (NIAID) at the National Institutes of Health (NIH), and the Bill & Melinda Gates Foundation. The study was coordinated by MORU, the Mahidol Oxford Research Programme funded by the Wellcome Trust.